Trying to be healthy but craving a delicious healthy cheesesteak? Say no more! 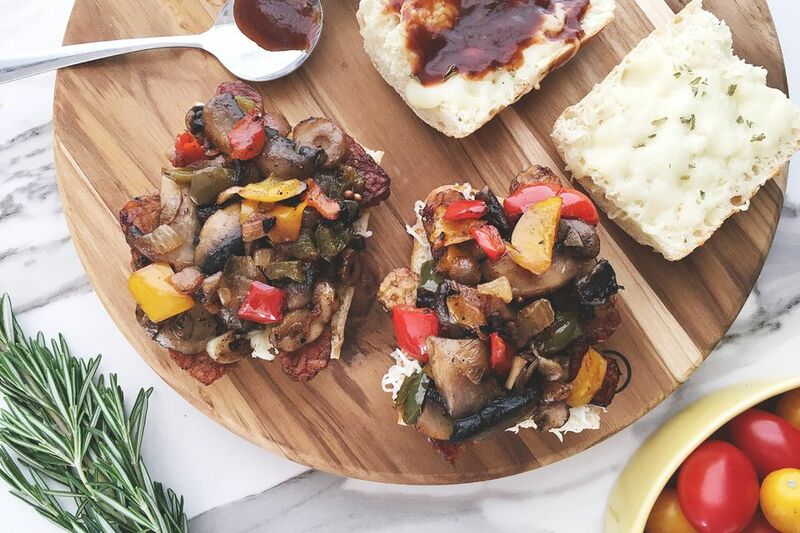 This health'd up version is made with a hallowed out french bread, pan-fried tempeh, sauteed peppers, onions, shallots, and mushrooms and slathered with reduced calorie cheese and umami-packed steak sauce. Begin by adding 1 tbsp of olive oil into a shallow fry pan. Turn the heat to medium and once the oil heats up add the red pepper flakes and stir. Add in the shallots and cook for a few minutes until they begin to soften then add the mushrooms, making sure not to overcrowd the pan, and cook for a few minutes until browned. Remove from the pan, leaving the oil in the pan. Add the onion, another pinch of salt, and cook for a few minutes more. Add the chopped bell peppers and cook until the entire mix has softened up. Season with salt and pepper to taste. Remove from heat and set aside - leaving the excess oil in the pan. Still over medium heat, add another tbsp of olive oil and stir, scraping up the bits of peppers, onions, and shallots. Add the tempeh and season with the steak seasoning. Pan fry for a few minutes on each side until the tempeh has crisped up and is golden. Slice the french baguette in half and scrape out the interior bread if you're trying to be more healthy. Evenly distribute the reduced fat provolone onto each side of the baguette and place in the broiler for a few minutes until the cheese begins to melt. Add the tempeh, the cooked onions, peppers, mushrooms and shallots and top with a smear of steak sauce. Serve immediately.